Defining Substance Abuse Dependence. Continuum of Substance Use Behaviors. DSM IV Criteria. Additional Considerations. Characteristics and Classification of Substances. Characteristics of Substances. Substance Use and Conditioning. Physiological Functioning. Physiological Characteristics or Factors of the Substance User. Psychological Characteristics of the User. Sociocultural Environment. Classification of Substances. Development of Substance Abuse and Dependence. Models of Substance Dependence. Causal Factors of Substance Abuse and Dependence. Biological Mechanisms. Early Onset Variables. Late Onset Variables. Stages of Substance Dependence and Recovery. A Causal Model for Substance Abuse. Preblematic Behavior and Thought Patterns. Patterns of Use. Developmental Stages of Dependence. Recovery Stages. Experience of Object Loss. Relapse Symptoms. Relapse Autopsy. Process of Relapse. Special Issues of Substance Dependence. Assessment. Purpose of Assessment. Motivational Interviewing. Individualized Treatment Plan. Assessment Questions. Multivariate Treatment Planning. Important Components of a Substance Abuse History. Objective Assessment. Psychological and Neuropsychological Assessment. Substance-Related Assessment Inventories. Mnemonic Screening Devices. Functional Importance of Substance Use. Follow-up Assessment. Conceptual Assessment of Substance Abuse. Questionnaires. Factors Indicating a Need for Adolescent Substance Use Assessment. Adolescent Screening and Assessment. Diagnostic Criteria for Codependency. Special Topic: Employment Setting. Prevention. Treatment Guidelines. Biopsychosocial Perspective. A Simple Comparison of Recovery and Mental Health Models. Theoretical Orientation. The Role of 12-Step and Other Self-Help Programs. Harm Reduction. Special Considerations for Dual Diagnosis. The Individual Entering Treatment. Treatment Concerns. Rational Emotive Therapy Philosophy. Therapist Guidelines. Preparation of Individuals, Couples, and Families for Recovery. Treatment Prioritization. Course of Treatment. Agents of Change. Areas of Personal Vulnerability for those in Treatment. Obstacles to Change. Overcoming Obstacles to Change. Individualized Treatment Planning. Guidelines for an Intervention. Legal Issues Associated with Screening and Assessing Adolescent Substance Use. Role of Americans with Disabilities Act. Continuum of Care. Key Aspects of Treatment. Substance Abuse-Dependence Continuum of Care Services. ASAM-PPC-2 Assessment Criteria. Specific Substance Class Treatment Considerations Associated with Continuum of Care. Community Reinforcement. Controlled Drinking: A Treatment Alternative. Solution-Focused Therapy. Potential Problems. Strategies for Improving Motivation (Miller & Rollnick, 1991). Predictive Measures of Outcome. Therapist Responses to Slips. Decreasing Treatment Dropout Rate. Role of Family Treatment. Inpatient Treatment. Patient-Treatment Matching. Discharge and Aftercare. Treatment Interventions Supported by Research. Treatment Models. Medical Treatment for Substance Dependence. Integration of Psychotherapy and Pharmacotherapy. Evidence for Effectiveness of Combined Treatment. Individual Therapy. Importance and Usefulness of the Support Group Forum. Benefits of Support Groups. Therapeutic Group. Basic Areas of Education. Stages of Solution-Focused, Outcome-Oriented Treatment. Group Topics. Marital and Family Therapy. Family Therapy. Family Patterns of Substance Dependency. Stage of Family Intervention. Relapse. Aversion Therapy for Alcohol Dependence. Moderation of Use. Recommendations for Improving Substance Abuse Treatment. Special Populations and Dual Diagnosis. Key Issues for Treating Dual Diagnosis Individuals. Dual Diagnosis. Adolescents. Geriatrics. AIDS-HIV. Adults Molested as Children. Women and Minorities. Court-Mandated Treatment. Skill Building Resources. Risk Factors for Substance Abuse. Consequences of Substance Abuse. Six Cardinal Signs Indicating Substance Dependence. Symptoms of Alcoholism. Do I Have a Drinking Problem? Problem Drinker. Substance Use or Abuse: Diagnosing Dependency. Self-Diagnosis: Do You Have a Problem with Substance Use? Relationship Addiction. Compulsive Gambling. Sexual Addiction. Substance Dependency: A Family Illness. Understanding the Dynamics of the Chemically Dependent Family. Recovery Needs of Family Members. Identifying Patterns of Codependency. Does Someone You Know Have a Problem with Substances? Stage of Recovery. Recovery is a Choice. Your Choice. Why is Substance Abstinence Important? How has Substance Abuse Affected Your Life? How to Cut Down on Your Drinking. An Overview of Where I am and Where I am Going. Recovery Inventory. My Recovery Plan. Reviewing Your Recovery Plan. Preparation for Attending a 12-Step Meeting. The 12 Traditions of Alcoholics Anonymous. Twelve Steps Outline. Ten Steps (Modification of 12 Steps). Twelve Steps. Twelve Steps to Recovery. Taking Inventory. An Outline for Making Amends. The Five S's of Recovery. Understanding Craving. Assessing High-Risk Situations. Self-Monitoring Journal. Daily Log. Experience Log. Daily Recovery Schedule. Journal Writing as Part of Your Recovery. Evening and Weekend Schedule and Journal. Consequences. Relapse Prevention. Maintaining Progress. Interrupting Potential Relapse. Choices-Learning More About Yourself. Practicing Change. Increasing Self-Understanding. Lingering Withdrawal. What to do When Confronted with the Urge to Use. Points to Consider When Confronted with the Urge to Use Substances. Planning How to Cope with a Lapse. Dealing with a Slip, Lapse, or Relapse. Anticipating How to Cope with an Emergency. Getting Unstuck. Beast. Help Me. Refusal Skills. Substance Use Aggravates Stress. Self-Care Plan. Relaxing Without Substances. Excitement with Substances. Deep Breathing: A Relaxation Skill. Monitoring Use of Relaxation. Self-Control. Modified Drinking. What is Responsibility? Coping with Disappointment. Surviving the Holiday Blues. Stinking Thinking. Understanding the Role of Thinking and Relapse. Coping with Negative Thinking. Managing Thoughts about Using Substances. List of Symptoms Leading to Relapse. Symptoms of Relapse. Early Warning Signs. Reviewing Personal Risks of Relapse. Feeling Like Your Life is Out of Control. Dealing With Feeling Emotionally Overwhelmed. Prevention. Developing and Utilizing Social Support. How to Build a Recovery Support System. Maintaining a Support System. Factors that Interfere with Developing a Social Support System. The Role of Relationships and Substance Use. Defense Mechanism Definitions. Defense Mechanisms. Dealing with Fear. Breaking Through the Negative Thoughts Cycle. Thought Stopping. Fifteen Rules for Emotional Health. Dealing with Difficult People. Surviving the Loss of a Relationship. The Art of Negotiation. Self-Confidence. Coping with Confrontations. Dealing with Embarrassment of Being Self-Conscious. Coping with Embarrassment. Emotional First Steps for Dual Diagnosis. The Twelve Steps and Dual Diagnosis. Identifying Depression. Managing Depression. Understanding Grief. Daily Activity Schedule. Identifying Anxiety. Managing Anxiety. Anxiety Relapse. Identifying Feelings. Self-Honesty. Communication. Communicating Difficult Feelings. Constructively Expressing Angry Feelings. Dealing with Criticism and Giving Feedback. Understanding Anger. Managing Anger. Ways of Dealing with Anger. The Steps for Letting Go of Anger. Goal Setting. Goal Development. Setting Priorities. Problem Solving. Decision Making. Time Management. How to Budget. Your Personal Budget. Applying for a Job. How to Give a Good Job Interview. Setting Career Goals. Work Ethics. Survey of Personal Strengths. Writing a Thank You Letter. Sample Letter. Coping Skills for Caregivers. Guidelines for Family Members-Significant Others of the Alcoholic-Chemically Dependent Individual. Detaching with Love Versus Controlling. The Enabler-The Companion to the Dysfunctional-Substance Abusing Person. Healing for the Substance Abusing Family: From Enabling to Recovery. No Talk Rule. Stage of Family Adjustment to Substance Dependence. Ten Steps to Feeling Better if You are an Adolescent Living with Someone Who Uses Substances. First Step for Family Members and Significant Other. Functional Vs. Dysfunctional Families. Parenting Style and Adolescent Substance Use. Healthy Parenting, Healthy Family. The Healthy Family is a Parent-Centered Family. Parents Helping Children. Summary of Substances. I think My Child may be Using Substances. A Parent's Checklist about Adolescent Substance Use. Adolescent Substance Abuse Quiz. Actions to take if Your Child is Using Substances. Dealing with Peer Pressure. Family Rules and Expectations. Tips for Parents. Keeping Children Drug-Free. How Substance Abuse Harms an Unborn Child or Nursing Child. Fetal Alcohol Syndrome (FAS). Identifying Children of Substance Abusing Parents. Self-Esteem and Mentoring. Characteristics Often Found in Members of Substance-Dependent Families. How to Help Children Through a Crisis. A Parent's Pledge. The House with the Pink Elephant. Parents, Teenagers, and Honest Communication. Skills for Positive Parenting. Understanding the Experience of the Significant Other. Twelve Things You can do if Your Loved One is a Substance Abuser. Eight Steps for Feeling Better if You Live with Someone Who Abuses Substances. Breaking the Codependency Cycle. Signs of an Unhealthy Relationship. Ten Ways to Improve Your Marriage. Working Together. Being a Healthy Couple. Self-Acceptance. Stop the Rescuing. Adult Children of Alcoholics. Children of Alcoholics. The Consequences of Codependency. Feelings. Behaviors of the Codependent. How to Deal with Codependency. Couples Homework. Couples Learning to Solve Problems. Relationship Challenges. Improving Relationships by Using Clear Communication. Communication Guidelines. A Senior's Guide for Using Medications Wisely. Nail in the Fence. Information Sheets. National Helplines. 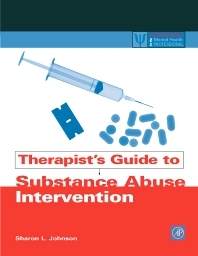 Author of AP's bestselling "Therapist's Guide to Clinical Intervention" now turns her attention to substance abuse intervention. The book will follow a similar format to her previous book, presenting information in easy to read outline form, with relevant forms, patient questionnaires, checklists, business documents, etc. Part I discusses the social impact of substance abuse and provides a general overview of the physiological and psychological characteristics of abuse, DSM IV definition of abuse, and classifications of the varying types of drugs. Part II is the main section of the book and covers assessment, different stages of abuse/recovery, and treatment choices. Coverage includes the discussion of myriad self help choices (e.g. AA), group therapy, brief therapy, and more. Discussion will also include making a determination of treatment as inpatient or outpatient, and issues relevant to special populations (teenagers, geriatrics, comorbidity patients, etc.). Part III presents skill building resources. Part IV covers prevention, quality assurance, and also includes a glossary. Practicing clinicians/therapists in independent and group practice or in hospital settings. Sharon Johnson is a psychologist in private practice. She has participated as a committee member and chair of a Utilization Management Committee for a managed care company.